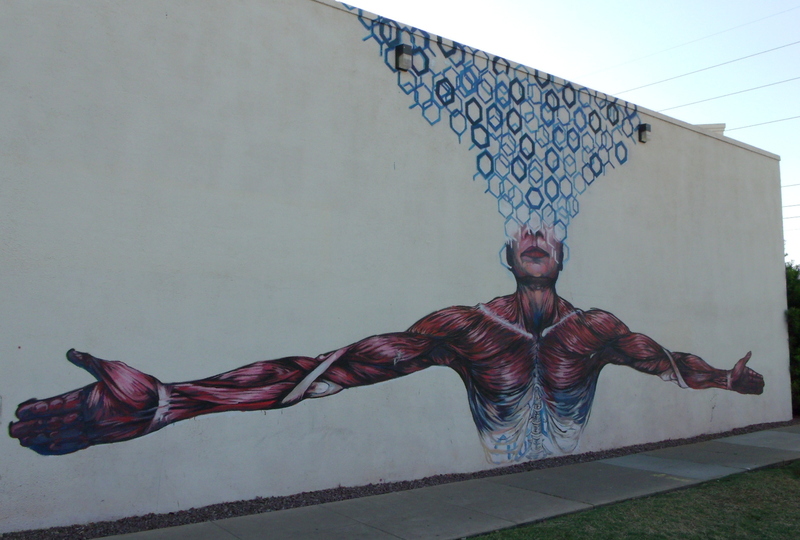 It’s been over six months since I shared an installment of the street-art or building murals that I’ve encountered in the greater Phoenix area. I suppose it was good timing, then, that something caught my eye the other morning as I was out in the field for work…at 137 E University Drive in Mesa…. The address was not on my itinerary for places to visit, but I couldn’t drive past without stopping to make a few images. A previously unseen (by me) mural glowing invitingly on the side of the road…on the side of the wall at Mesa’s United Way building, actually. While I thought the deeper meaning of the mural might have something to do with enriching the lives of Mesa’s children, families, etc., it was actually sponsored by one of the local power companies, Salt River Project. Click on the highlighted words to see more about the “#Powerisallyours” campaign. 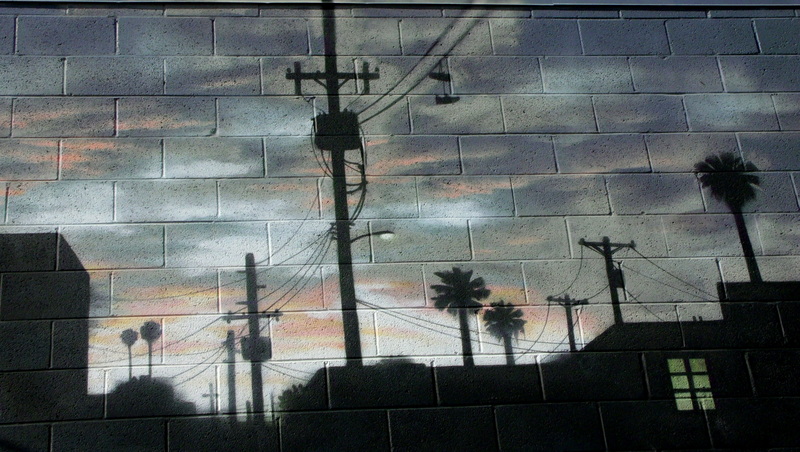 As far as the artist is concerned, I had seen one of his other murals on the backside of a coffee shop in Phoenix, but had not yet visited it to make any photos. Click on his highlighted name to learn more about Addison Karl, a multi-media artist from Munich who has murals all over the world. 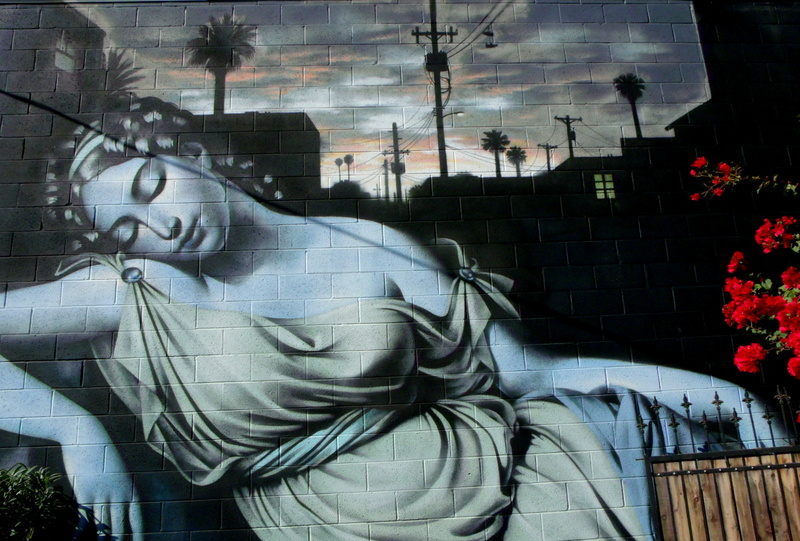 If you’d like to see the earlier posts of street art and building murals from the greater Phoenix or Salt Lake City areas, you can scroll down to the Categories widget at the bottom right-hand side of this page and click on the “Street Art – Graffiti” link. As always, thanks for visiting and spending a few minutes of your day with me. Not like in the war for heroic deeds performed on the battlefield when risking one’s own life to save others’, but as in making something that could be considered plain or even unattractive, pretty, glittery, sparkly, refreshing to look at, and many other etceteras and etceteras…. I found myself downtown with over three hours of free and available time, yesterday morning, before having to report to work for a particular outreach event, so I intentionally brought my camera with me and visited what has been christened the “Grand Avenue Arts District” and found more than a couple of things to photograph. In addition to the dozens of photos I snapped of local street art and murals, I found this row of decorated Aloe Vera and could not resist spending a few minutes’ time making a handful of images. The morning’s sun was still gentle at 7:45, but the day had already started to heat up and another scorcher was underway. If you want a glimpse into the Grand Avenue Arts District, you can click here and here, or visit Google and click away to your heart’s content…. Appearing on the east-facing wall of the Roosevelt Community Church at 924 N. 1st Street, in Phoenix, this familiar sight finally became subject for one of my stops during a photographic excursion that included the abstract net-art that I featured in this earlier post, Her Secret is Patience. This was a rather fruitful venture, as it provided fodder for at least another five City Paint Phoenix features that will appear here in the next several weeks. I won’t claim to have any understanding, knowledge, or insight into the meaning of the mural or its significance on the side of a church building whose congregation purports to be open-minded and accepting of all peoples, etc., etc., but I will suggest that maybe it has something to do with the connectedness of the members of the human species, as displayed by the red-meat that we all possess beneath our variously hued external coverings of skin…rising from the dust of the earth…and then, maybe…our spirit/energy/soul/etc. transcending our terrestrial trappings and going out into the ether to join the rest of the cosmos…etc., etc., and so on…I don’t know. I already said that…I just don’t know. 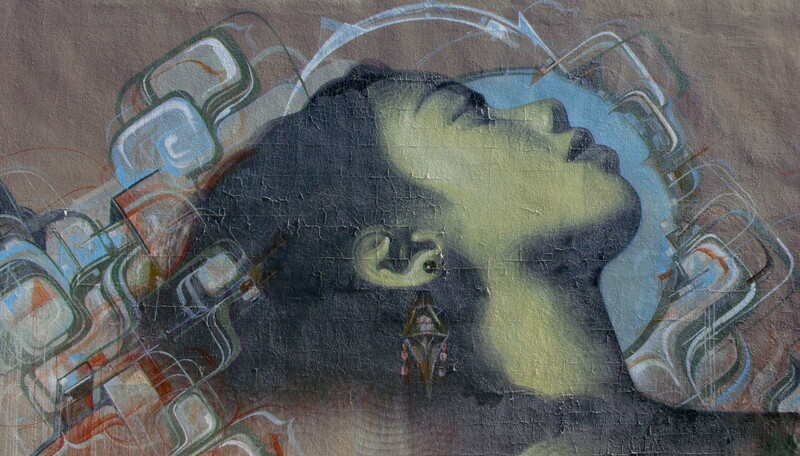 But here it is anyway, an intriguing mural along Roosevelt Row, another contribution to the local street-art scene. 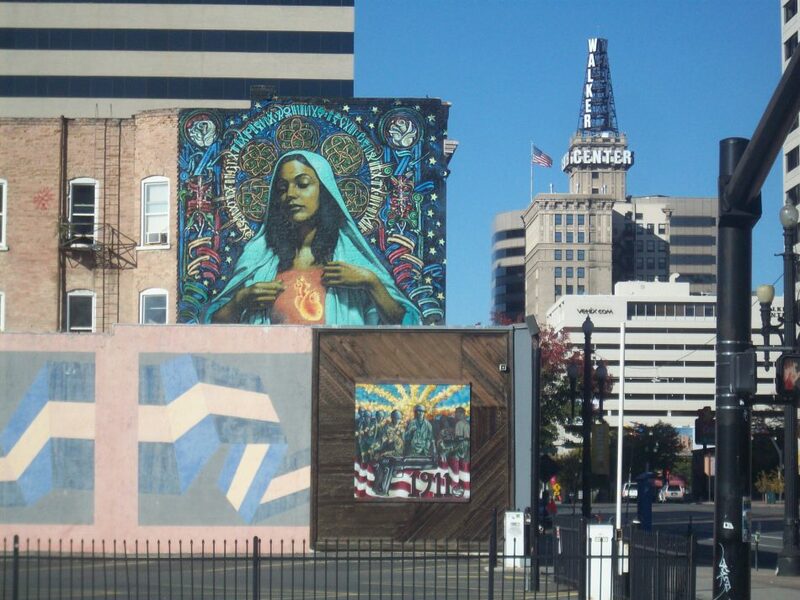 The only artist attribution I could find for the mural was a single article in a local newspaper that provided three names – Bishop Ortega, Larry Valencia, and Anthony Vasquez. As always, I hope you’ve enjoyed this latest addition to the City Paint Phoenix street art series…and I thank you for visiting. I think it would be fun to hear/read what you think of the mural and what it might mean. I know there are several friends here who have extensive experience in the art world…so please feel free to share your thoughts…. Driving through the city on my way to work a few weeks ago, I happened to look south and spied a couple of faces staring back at me. I had time to spare before I had to clock-in at the office, so I parked the truck on a side street and took a little walk with my camera. Moving a little closer, and a little to the east to get the tree out of the way…. I walked down the street a bit and attempted to approach the mural from the property entrance to the left of the mural and found that there was yet more…. Three more faces, two of the masked people and….a snowman? Given that this wall was right at the entrance to the parking lot of a small apartment building, there was no problem gaining access and taking a few closer shots. Enjoy the gallery….and remember that you can click on any image to be taken to a sort of slide-show that allows you to view each image in a larger format. As I was heading back to the truck, I happened to glance across the street and found yet another Cabeza Curiosa mural…. 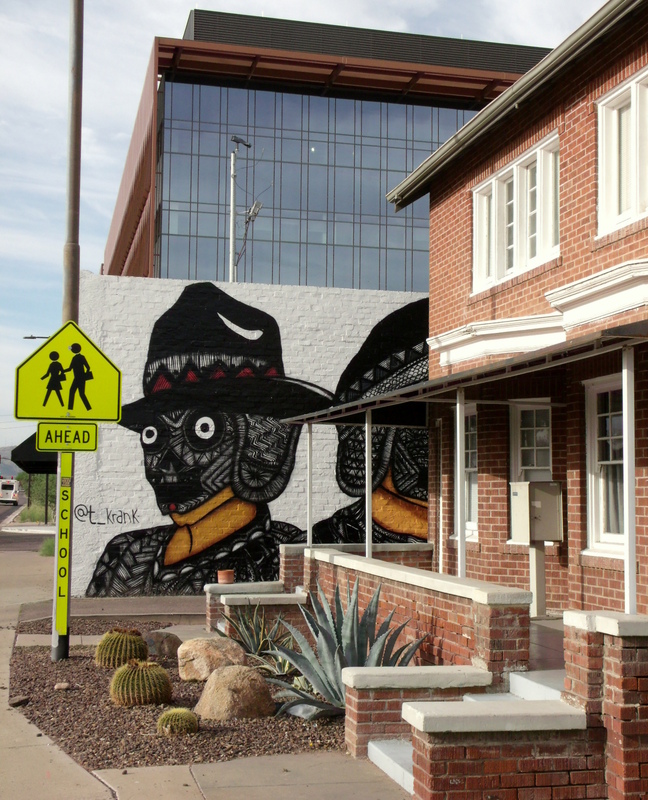 I found these murals on buildings located at the intersection of 7th Street and Pierce, just east of downtown proper in Phoenix, Arizona. As you can see in three of the images above, the artist is listed as “@t_krank” on Twitter, Tyson Krank, and you can follow this link to a short article about him in one of the local newspapers. I found this mural quite by accident a little over a month ago. I had intentionally taken a different route to work so that I could photograph a particular mural, and afterwards, I happened to spy this bit of purple and blue decorating a wall a couple of blocks away. So, at the risk of being late to the office and missing the “timely punch” of the clock, I stopped and made a few more hasty images. The mural is located on the north wall of a downtown theater called the “Film Bar.” It is located at 812 North 2nd Street, which makes it about two miles from my workplace…and just down the road a little bit from the area that I have mentioned here on several occasions, Roosevelt Row, a showcase of local street art and culture. This first gallery shows the complete mural and then the sections, moving from left to right…. This second gallery presents some greater detail in isolation form…. Walking around the building to where I had seen some “graffiti-type” art decorating a trash dumpster, I found this surplus image on the east-facing wall…obviously touched with the morning’s sun and companion shadows. 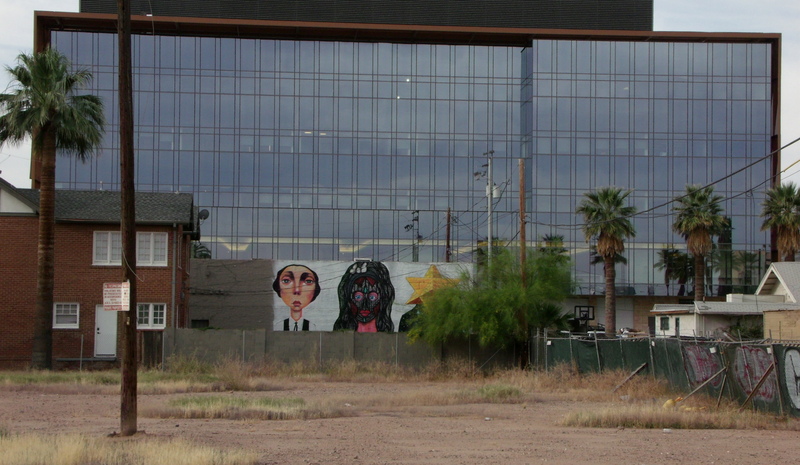 The last photograph shows the signature of the artist, Joe Rael, whom you might remember from an earlier post, City Paint Phoenix 2 – Hair Pollution. 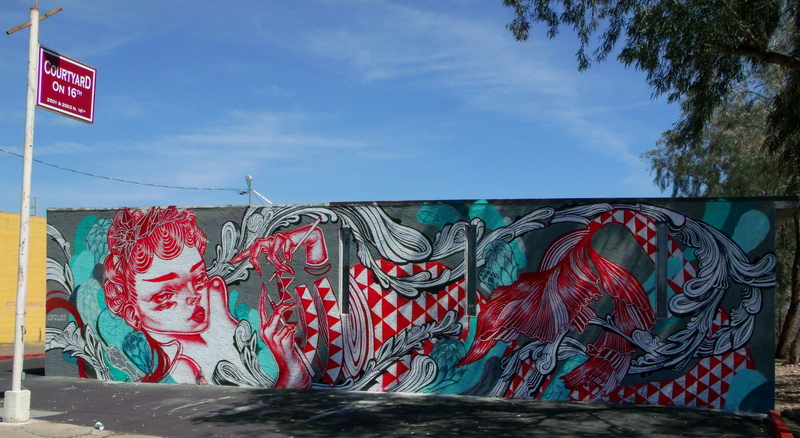 If you’d like to see more of the City Paint Phoenix posts, or earlier images of street art in Salt Lake City, you can scroll to the bottom of the page and click on the Street Art – Graffiti title under the Categories widget to be taken to a continuous feed of the posts. In a comment on another post, I mentioned to Andy at LensScaper that I happened to see some artists painting murals that day…. …and I said I’d be going back to capture some images of the work. I didn’t get there the next day, like I had hoped, but I did manage to get there a little later when the mural was complete. Coincidentally, the owner of the building (Joseph…or maybe it was James….?) was walking out to his vehicle as I was driving mine into the parking lot. After asking if it was OK to be there on the property and make some photos, I asked the man if he knew anything about the mural. He mentioned that an artist from Hong Kong was actually brought into town to create the mural as part of the Paint Phoenix 2015 paint festival….and that this is a mermaid weaving (knitting?) her tail. Joseph also mentioned something about it being the subject of a Chinese myth, but maybe I misunderstood or got that part of the conversation mixed-up with another part in which he was discussing a Native American/Pacific Islander combination mural that’s on the other side of the building…which I shall be featuring here shortly. And finally, Joseph/James, also told me about a couple of other locations nearby where I could find some wall murals painted by other artists who participated in the event…again…to be shown in another post. To wrap-up the post, I’ve included a small gallery of some isolation images that you can click on to see in greater detail. And as always, if you’d like to see more of the City Paint Phoenix posts, or even earlier images of street art in Salt Lake City, you can scroll to the bottom of the page and click on the Street Art – Graffiti title under the Categories widget to be taken to a continuous feed of the posts. 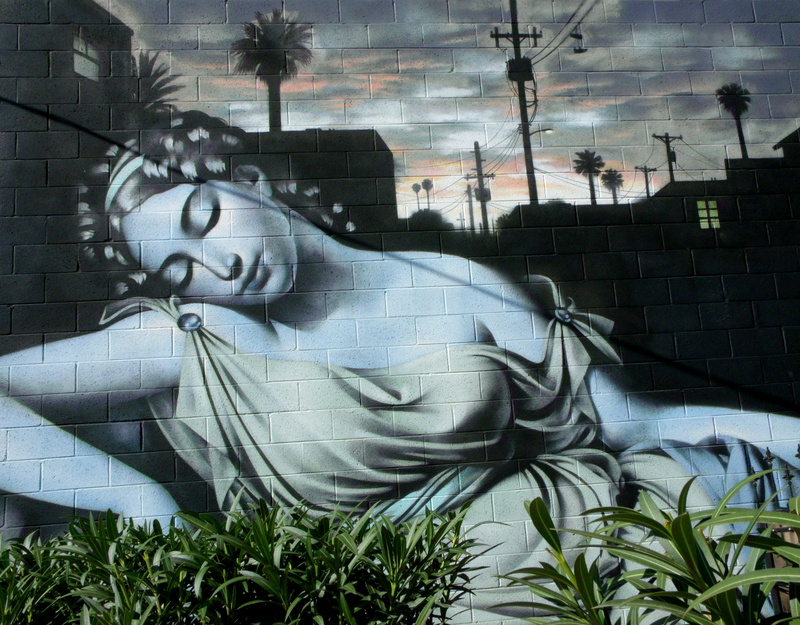 I’ve seen it referred to as “The Phoenix Goddess” in a few different locations, but the artist, El Mac, refers to it as Southwest Goddess on his website…click here if you’d like to check it out for yourself. The directions I found on-line on how to find the mural states simply that it’s in an alley south of McDowell Road between 3rd and 5th Avenues…another set of directions indicate that it’s on an essentially hidden wall of the Laird Apartments at 317 West McDowell Road. I happened to find it through the first directions, driving up and down alleyways…. There were two other murals close-by, one of which you can see in green paint on the left side of the first image above. I may feature them in a later post. The fact that the mural is on the east-facing wall of the apartments might have something to do with it remaining in such good condition after being there for 10 years. 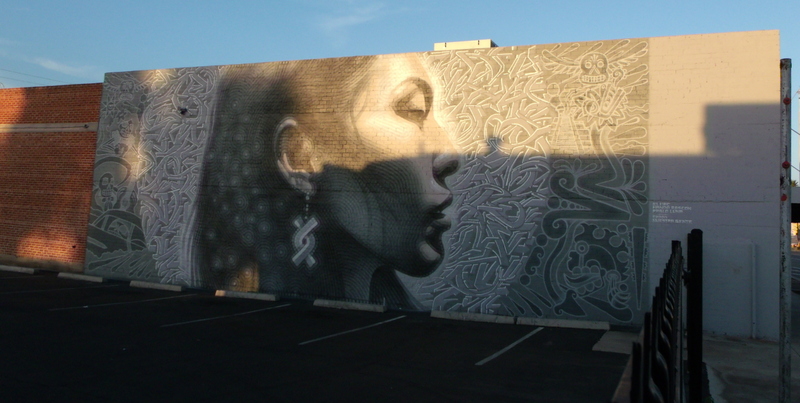 This is the fourth mural by El Mac that I’ve featured in the City Paint series…two others in Phoenix and one in Salt Lake City. I have already collected images of two of his other murals in the Phoenix area and know where a third one is, but haven’t gotten to it yet with my camera. If you’ve enjoyed viewing this fine example of street art, spray-paint murals, building art, or whatever else you’d like to call it, you can scroll to the bottom of the page and click Street Art – Graffiti under the Categories widget to see more posts containing this genre of art from both Phoenix and Salt Lake City, Utah. Candace mentioned that the mural is located at Heavy Pedal…and when I Googled that name, I found that it’s located just down the road from my work-place, at 1309 East Van Buren Street. When I checked further to learn anything I could about the mural, I found this article in the Phoenix New Times. I stopped by the shop on my way to work with the intention of capturing some images of the mural without any cars parked in front of it…but being on the east-facing side of the building, it was the recipient of the morning’s light from the rising sun…and the attendant shadows that ride along with it. So, the first two images (taken from outside of the gated and locked parking lot) show the shadows and glow of the sunrise, and the photographs in the following gallery show what it looked like about three and a half hours later. If you’d like to view the images in greater detail, just click on any photo in the gallery to be taken to a slide-show where they are displayed in a larger format. 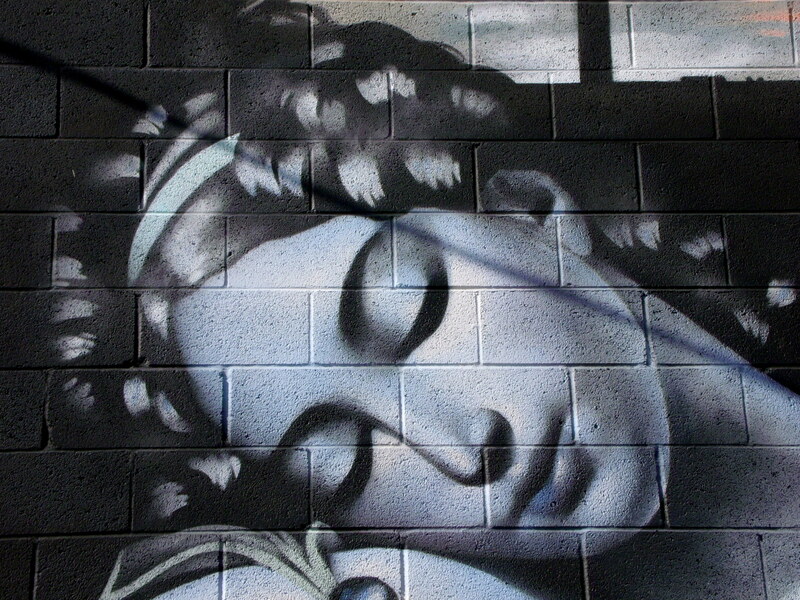 It’s crazy and wonderful what these guys can do with spray paint…. 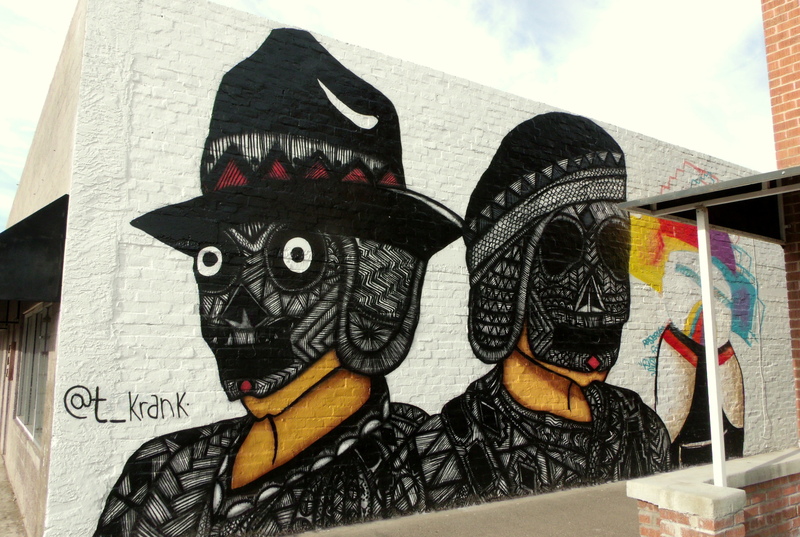 And…if you’d like to see earlier posts on street and building art in Phoenix and Salt Lake City, you can scroll to the bottom of the page, find the Categories widget, and click on Street Art – Graffiti to be taken to a continuous scroll of the posts. City Paint Phoenix 3 – Flowers…with a Salt Lake City connection…. I’ve been traveling the streets of Phoenix for the past five months with a new eye that is open and welcoming of things that I had never noticed in my earlier years of living here. If you’ve been following this blog for at least a little while, you might know or recall that I’ve recently returned to this desert home after living in the Salt Lake City area for about four years…after having lived here in Phoenix for over 20 years…and you might remember, too, that I started a City Paint series in Phoenix that was similar to a series that I had going in Salt Lake for a couple of years. Well…this is the third post in my collection of graffiti and street art displays that I’ve discovered while driving about my new/old home. 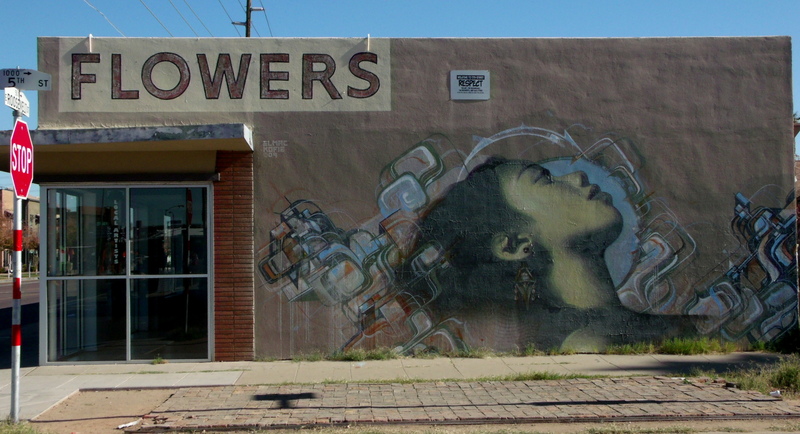 This flower shop is located on the south-east corner of 5th Street and Roosevelt Street, just south of the center of town in an area that has become something of an art district over the last several years. From all appearances, the flower shop has closed its doors for business…the rooms were empty as I looked in from the street…and as you can tell by looking at this second image, the plaster is cracking on the wall and the paint is beginning to peel…which is understandable, given that the mural is on the west-facing wall of the building and in near constant exposure to the desert sun. 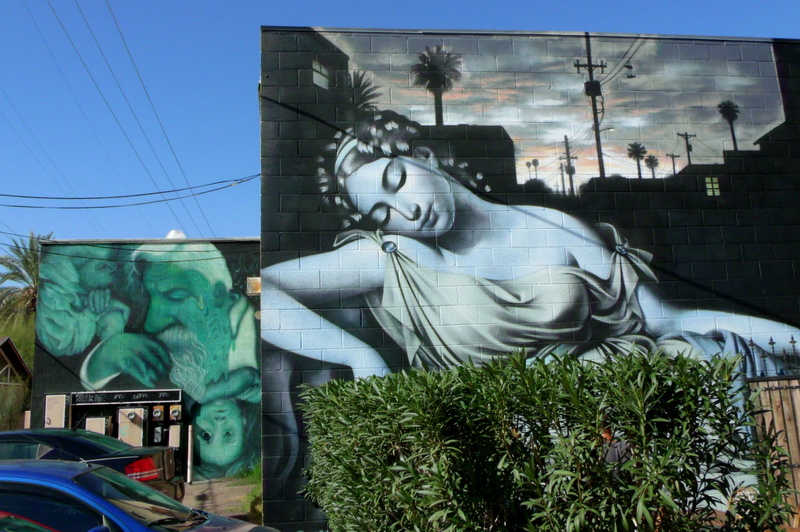 When I did a Google search of the artists (as provided by the names under the “E” in the first photo), I found that El Mac had created another image that I had seen in the past…which I had shared in another blog post almost three years ago. I featured the below photograph in In the Heart of the City and in City Paint 4 – Tucked-Away Alley-Way, and provided a third glimpse of it in the first image from City Paint 17 – Gallenson’s Gun-shop Elk Mural. 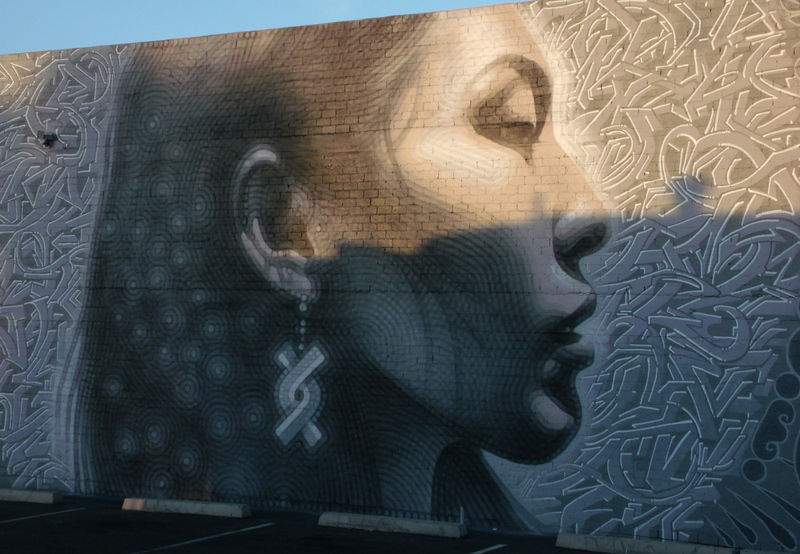 You can find these murals on El Mac’s web site at Ave Maria and Kofie and Mac…pages five and eight if you want to visit from going to his home-page. After you get to his home-page, click on the “Spraypaint” subheading…and be prepared to be amazed at what you’ll find. If you’d like to view more posts on the street art, building murals, and related graffiti that I’ve discovered in both the Salt Lake and Phoenix areas, you can scroll to the bottom of this page and click on Street Art – Graffiti under the Categories widget to see the earlier other posts. It’s been a few weeks since I started the City Paint Phoenix series, but here’s the second installment…all images were taken the same morning as the first of the series, City Paint Phoenix 1 – “Old Man Phoenix.” I don’t have a single image of the entire mural, as I would have had to stand a couple of dozen feet further away, and doing so would have brought me fully into the morning sun, so please try to imagine these first six images linked together from left to right, and you’ll have the entire mural. This piece of art is on the west-facing wall of a salon named, “Hair Pollution,” at 1524 E McDowell Road in Phoenix proper. 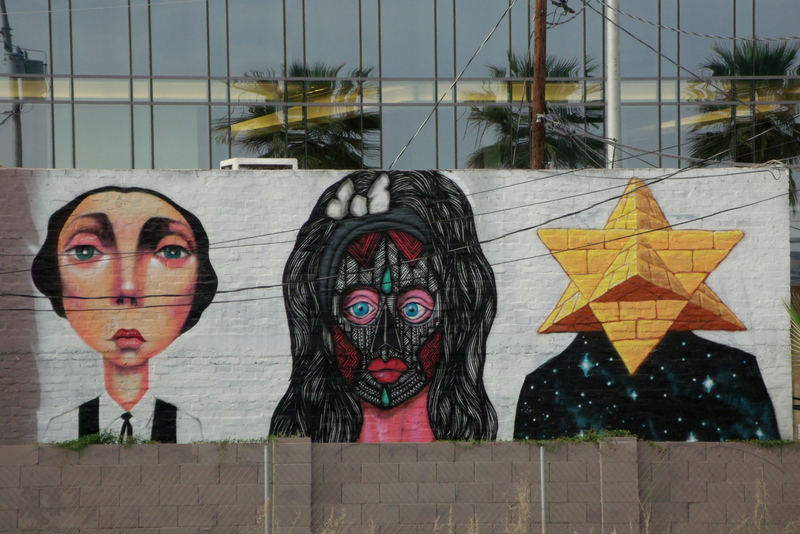 I’m not sure how long the mural has been on this wall, but I found various links to it on-line, dating from 2012…when the paint was much less faded by the Arizona sun. The second collection of photographs are close-ups or isolation shots of the various components, elements of the greater mural that struck me as significant in their singularity and caused me to wonder at how and why they might or could be related in such a way that would cause the artist, Joerael Julian Elliott, to combine them in this presentation. By the way, if you follow the link to the artist’s website, you’ll find (among other fantastic and wonderful things) a photo of the mural in its full form if you click on the “Public, and then the “Street” tabs. Also, please remember that you can click on any image to be taken to a slide-show that provides an even closer look at each photograph. I hope you’ve enjoyed this second showing in the series of City Paint Phoenix…a representation of some of the street and building art that I’ve found during my commute and wanderings in my new and old home of Phoenix, Arizona, USA. 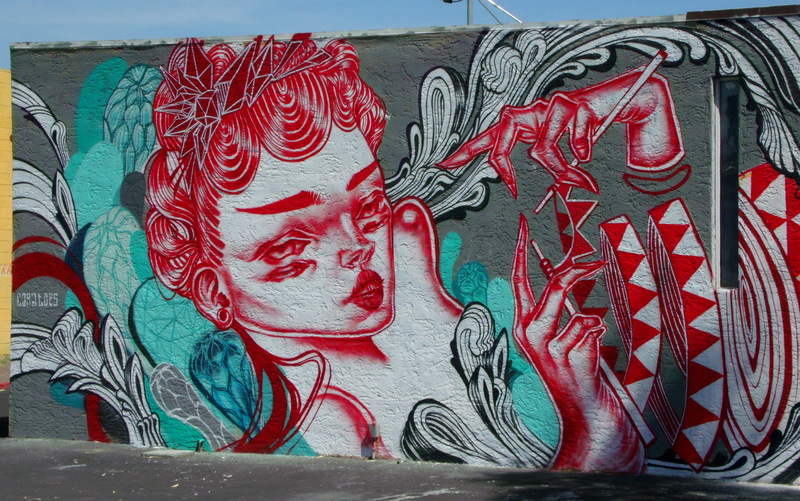 If you’d like to see earlier postings, from both Phoenix and Salt Lake City, you can scroll to the bottom of this page and find the Categories widget…click on Street Art – Graffiti, and you’ll be taken to a continuous scroll of those earlier posts. Thank you for visiting….